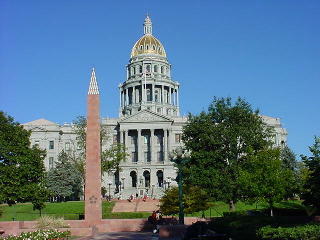 Downtown Denver, CO is a beautiful place for the beer lover. 16th Street runs right through the heart of downtown and contains a very welcoming and walkable pedestrian mall along its entire length. If your feet ever get tired in Denver, head to 16th Street where you can hop on the free mall shuttle bus and travel up and down as much as you like. Denver is home each Fall to the Great American Beer Festival (GABF) which is the largest and most respected beer event in the United States. Denver also has an exceptional concentration of interesting brewpubs and beer bars where beer fans can quaff some fresh house beers and local microbrews. The list below contains photos and brief information about my favorite beer spots that are walkable in downtown Denver, so be sure to print this page out and take it along on your next visit to the mile high city. Are you on the hunt for the perfect piece of Colorado land for sale? If you are moving to Colorado and are specifically going to live in the Denver area, browse our selection of Denver real estate! No matter what type of housing you are looking for, our Colorado home finder will help you out! If you want the best in Colorado real estate, sign online today! 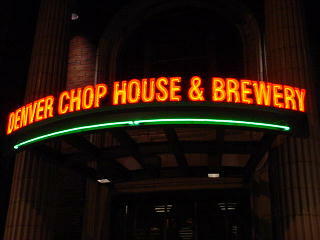 What a marvelous brewpub that was founded and is owned by the new Denver mayor, John Hickenlooper. 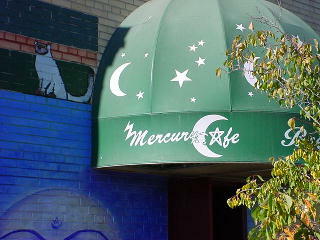 The place is friendly, cozy, inviting, and has excellent food and house brews. Located in the enjoyable part of northwest downtown called LoDo (for "lower downtown" because it's downhill near the river), Wynkoop is housed in a large, restored warehouse with pool tables upstairs and brewroom, bar, and dining area downstairs. Each year Wynkoop runs the "Beer Drinker of the Year" competition where beer geeks from all over the United States compete for the top honor that would entitle the lucky winner to free beer for life at Wynkoop. Be sure to try the full sampler of their beers. 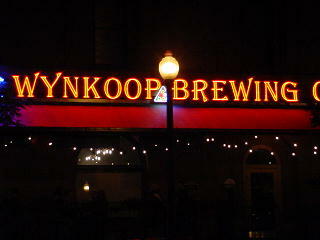 Go to Wynkoop first when you arrive in Denver -- you won't regret it. 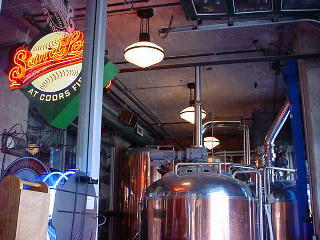 Located on one corner of the attractive Coors Field baseball stadium in Denver is the Sandlot Brewery and Rounders Pub. Sandlot is a test brewpub for Coors (which is located nearby in Golden, CO) and also produces all the Blue Moon that is sold at the stadium. The pub is only open from 11 am to 2 pm Monday through Saturday, and during Rockies games it is closed to the public and only accessible from inside Coors Field for attendees of the baseball game. Pictured above and to the right is brewer Tom Hail pulling a pint of one of his brewmaster special ales that have won numerous awards at the GABF. Be sure to try their rich, house, specialty brews while you sit and have a tasty burger or sandwich and enjoy the view of the playing field through the large back windows. 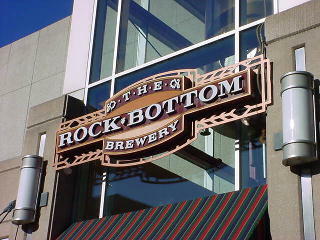 Rock Bottom has one of its largest and best brewpubs right on the pedestrian shopping area along central 16th Street. The food at Rock Bottom is quite amazing with salmon, pizzas, and smoked chicken enchiladas being some of my favorites. When I last visited, their beer list included a Weizen, Saison, Rocktoberfest, Stout, India Pale Ale, and Brown Ale. Sample their cask ales (conditioned and carbonated naturally inside small kegs) and enjoy a game of pool in the poolroom bar. Located down near Coors Field, Breckenridge is a comfortable brewpub with some delicious house beers that include: Hefe Proper Wheat Beer, Avalanche Amber Ale, Ballpark Brown Ale, Trademark Pale Ale, 2220 Red Ale, Oatmeal Stout and several nice seasonals. The menu is fairly large with wings, nachos, salads, sandwiches, chicken and hamburgers (and bison burgers), Southwestern specials, and great brewpub fare made with their house beers. 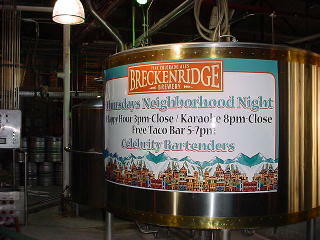 Breckenridge has a brewroom that is open to the bar and restaurant. 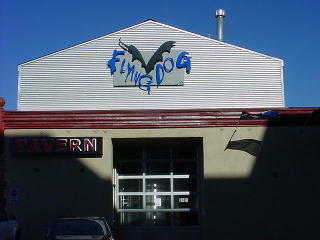 Just a couple of blocks from Breckenridge brewpub, you'll find the famous Flying Dog microbrewery. 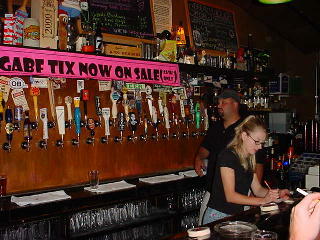 Flying Dog produces a fine litter of ales that are available in several states. Their new facility on Blake Street offers occasional tours (call ahead) and is located right next to the Blake Street Tavern. While you enjoy your craft beer, you can look through the Tavern's windows into the operations of the Flying Dog Brewery. 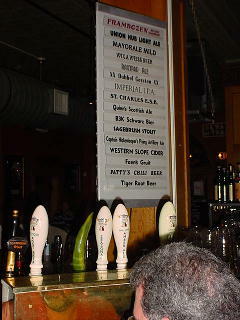 Blake Tavern's taps include around six very fresh selections from Flying Dog (location is the key here). Clam chowder, Thai ahi tuna salad, turkey and buffalo burgers, and BBQ sandwiches round out the menu -- along with a Rockies game day special that offers a Flying Dog pint and a brat for only $6.95. 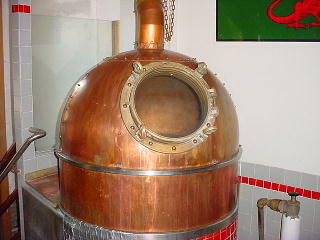 This microbrewery is open Monday through Friday from 8 am to 5 pm and offers tours to interested persons who call ahead. There is no pub here -- only a brewing facility that was started by Brian and Tara Dunn in the early 1990's. Great Divide produces around nine beers that are rich and flavorful and available in a few states outside of Colorado. Beers include: Whitewater Wheat, Bee Sting Honey Ale, Denver Pale Ale, Arapahoe Amber, St. Brigid's Porter, Wild Raspberry, and Hibernation Ale (I am a big fan of the malty and potent Hibernation Ale). This large, popular brewpub is located in LoDo near the old central train station and is decorated inside a bit like a vintage train dining car. Their beers are pleasant and flavorful with an upscale (and slightly pricey) menu that includes mussels, crab cakes, escargot, filet mignon, Iowa pork chops, salmon, lobster, gorgonzola-stuffed steak, salads, burgers, pizza, and herb-crusted rack of lamb. The Chophouse is only open for dinner Monday through Sunday. This brewpub is loaded with personality and real ale that is served up at a pleasant 50 degrees F with proper lower carbonation levels. 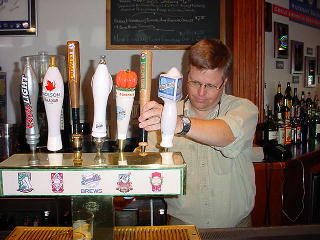 Real ale is beer that is unfiltered and allowed to mature and condition in small kegs -- it is fresh, soft, and flavorful. The lineup at Pints has Phonebox Amber (light, easy-drinking ale), Airedale Pale Ale, Gael Force Ale (a bit sweet and mild), Dark Star Ale (strong and robust), Lancer India Pale Ale (nice citrus hop aroma and flavor), and Alchemy ESB (very light and creamy). The tiny brewery in located in a backroom, and the serving vessels are in the basement (visible through a small window in the floor). There is also a huge whiskey selection here and almost 15 guest beers. British pub grub fills the menu with classic items such as bangers and mash, ploughman's platter, and Sheepherder's Stew. Pints is just southwest of the state capitol -- a short walk from the south end of the 16th Street mall light rail bus station. 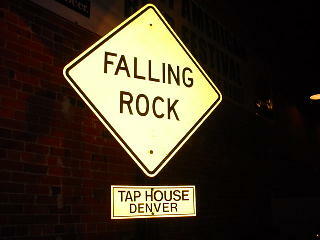 Falling Rock is the best beer bar in Denver. Your jaw will drop in amazement as you gaze at over 80 taps and a bottle selection that includes rare Belgian Lambics, Abbey Ales, and high-gravity gourmet beers from around the world. The kitchen turns out some really good pub fare, and there is live music. An impressive bottle collection adorns the walls of the Falling Rock, and a pool/dart room is located downstairs. No beer fan should miss this place! Located right across the street from the Wynkoop brewpub (listed at top), this gorgeous European-style restaurant and bar has incredible food items such as buckwheat crepes, smoked salmon, steamed mussels, mesclun salad, halibut, pork chops, duck, steaks, and farmhouse cheeses. The wine list is nice, but the real star here is the selection of imported beers such as Chimay, Hoegaarden, Affligem Dubbel and Tripel, Duinen Ales, Duvel, and many products from the Unibroue Brewery in Canada. 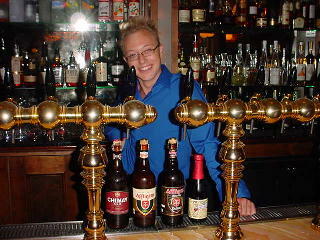 The bar manager, Oran Field, is pictured above. Oran is planning to make the beer list here even more impressive in the future! For a bit of France and Belgium in Denver's LoDo, be sure to stop into Brasserie Rouge. This funky bar and restaurant is a bit off the popular tourist path, so take a taxi if you are heading there after dark. Mercury features six beer taps that are filled with local microbrews and a menu loaded with tasty, hearty, healthy dishes (including many for vegetarians). Old Chicago, 1415 Market Street, ph: 303-893-1806. 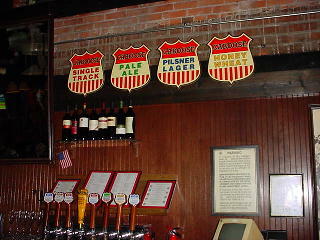 This is part of the Old Chicago chain of beer bars. 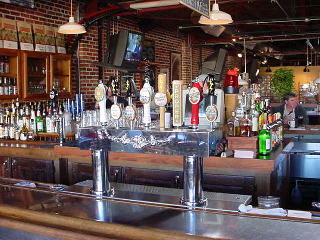 It is a fantastic place with over 35 taps that include good regional beers and imports. There is also scrumptious Chicago-style pizza, video games, and lots of TV's for sports fans. 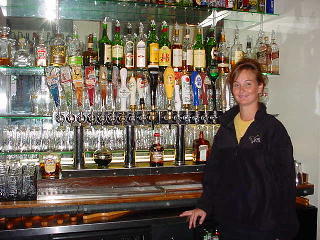 Nallen's Irish Pub, 1429 Market Street, ph: 303-572-0667. Located next to Old Chicago (listed above), Nallen's is a good place to stop in for a late night Guinness nightcap. It is a small Irish pub and sports bar. IL Vicino, 550 Broadway (at corner of Broadway and 6th), ph: 303-861-0860. This brewpub chain has great house beers and upscale pizza and Italian food. 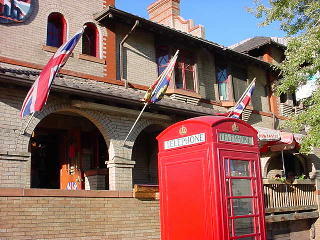 Bull and Bush Pub and Brewery, 4700 Cherry Creek Dr. South, ph: 303-759-0333. 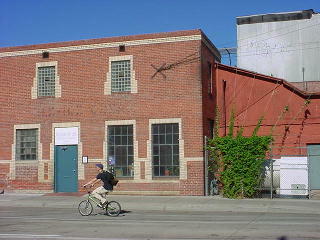 This fun brewpub is about a $40 round-trip taxi ride (in 2003) to a southern suburb of Denver. They have many unique and flavorful house beers.